Cricket bloggers have a tendency to come and go, say what they have to say, and move on. Samir, I think, gets better and better. I enjoy his style of taking a stray or miscellaneous pensée, then comparing and contrasting, unpicking and elaborating, until a surprisingly rigorous argument has been constructed and a provocative conclusion reached. Cricket literature owes much to the passionate amateur, the professional in another field who brings to his writings on the game a perspective that is a nice mixture of the fan’s, the intellectual’s, the romantic’s and that of the sporting obsessive steeped in the game’s legend and lore. Eye on Cricket brings these elements together….This collection is a wonderful reconciliation of the past with the present as nostalgia and current events mingle in the mind of the creative commentator to emphasise the past in the present and vice versa. For readers who grew up on a diet of Indian Premier League matches, this may not hold your interest unless you also enjoy a healthy serving of Test cricket. The author makes a note early on that he is a child of the five-day format, and that distinctly colours his view of the game. However, if you’re an old soul or just one for nostalgia – something that Chopra definitely excels in – look no further than this book. As is the case with any other sport, in cricket as well, all great cricketers earn their nicknames; such as the likes of the great Michael Hussey and Sachin Tendulkar who graced the cricketing fields with their majestic presence, and eventually became popular as `Mr Cricket` and `The Little Master` respectively. Samir Chopra, the author of Eye on Cricket, which is a compilation of a number of essays that he has penned down on the glorious game of cricket, immensely deserves a nickname of this sort as well. He may not be a champion batsman whose stroke-play enthrals fans globally, but the strokes of his pen and the intensity of his emotions are unrivalled when it comes to acutelyanalysing and writing on cricket. Samir Chopra’s passion for the gentleman’s game shines through in his nostalgia-tinged ‘Eye on Cricket’…Chopra is a professor of philosophy in New York, but also a long-time and widely read blogger on cricket. I have read him in the past, but this collection showcases the breadth of his passion for the game….There’s a lot to savour in Eye on Cricket. The essays in Eye on Cricket are based on Samir’s regular blog posts for ESPN Cricinfo. Their subjects range far beyond talking cricket with Americans. He writes about watching and playing the game in Delhi and Sydney, the highs and lows of contemporary Indian cricket, and great moments and figures in the sport’s history. But there is also much in his book that will resonate with fans of any sport: how we memorize statistics and interpret their meanings, the company of knowledgeable fans in the stands, even the imaginary games and entire campaigns we concoct as children. A philosophy professor by trade, Samir makes astute observations on his favorite sport, and sports in general, and delivers them in a rich literary style. 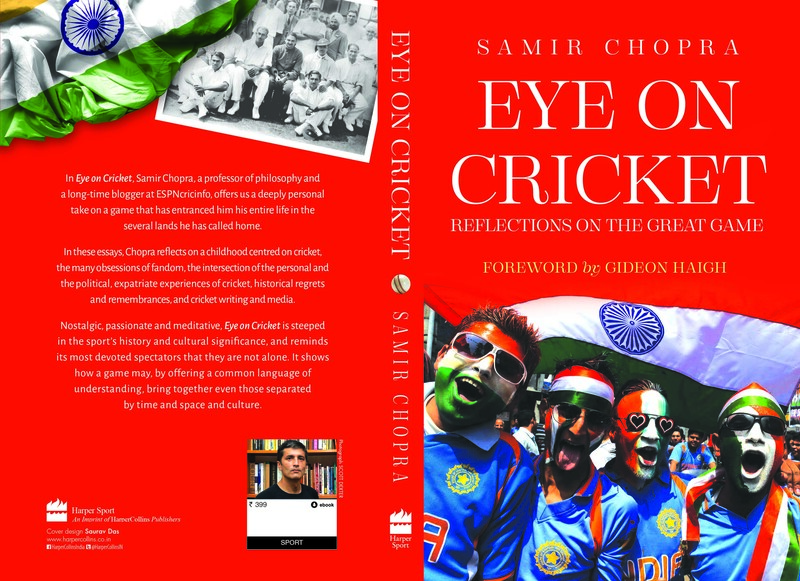 Samir Chopra’s new book Eye on Cricket: Reflections on the Great Game is a collection of essays that began as blog posts for ESPN Cricinfo. A professor of philosophy at Brooklyn College, Chopra looks at a range of topics in the game, past and present. One consistent theme throughout the book is his experience as a self-described “cricket exile,” someone who follows the sport from America, a land where cricket is at best ignored and at worst derided. Chopra conceded that life in cricket-hating America has sharpened his appreciation for the game, but he wishes that his neighbors would have a sliver of understanding for why he loves this sport. I would like to invite you for a cricket podcast. We can discuss details on an email exchange.